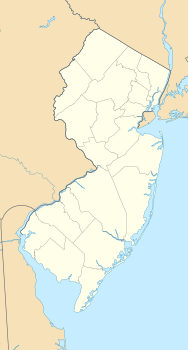 Breton Woods is an unincorporated community located within Brick Township, in Ocean County, New Jersey, United States. The community is located near the Metedeconk River and is bisected by Mantoloking Road (County Route 528). Except for commercial businesses located along Mantoloking Road, the area is made up of bungalows dotting the small roads throughout the area. Breton Woods was established in the 1930s when property developers laid out a community of summer homes. A post office was established at Breton Woods in 1937, and remained in operation until it was discontinued in 1960. ^ "Breton Woods". Geographic Names Information System. United States Geological Survey. Retrieved September 16, 2014. ^ Google (August 31, 2016). "Aerial view of Breton Woods" (Map). Google Maps. Google. Retrieved August 31, 2016. ^ Donatiello, Gene; Leavey, John (2013). Brick Township. Arcadia Publishing. p. 23. ISBN 978-0-7385-9764-5. 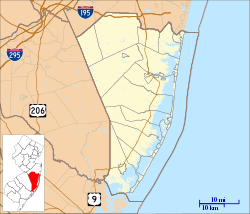 ^ "Ocean County". Jim Forte Postal History. Archived from the original on March 4, 2016. Retrieved September 16, 2014. This page was last edited on 13 October 2017, at 01:47 (UTC).